Whether a tooth is chipped, cracked, broken, decayed, or missing altogether, Dr. James Olsen and our team can make them beautiful again using dental crowns and bridges. Our practice only utilizes the strongest and most natural-looking materials to ensure that your restorations are durable, reliable, and virtually identical to your other teeth. 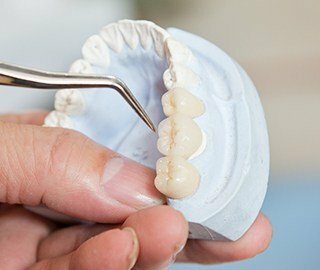 A dental crown is a tooth-shaped “cap” that is simply placed on top of a damaged tooth in order to restore its original shape, size, and appearance. They can be made of a variety of materials depending on which tooth you need to be repaired, and in most cases, they take about two appointments to be designed and placed. In any case, after a tooth has received a crown, it can be trusted to look great and function normally for many years to come. With a dental bridge, we can use two of these crowns to replace one or more missing teeth in a row. A crown will be placed on each of the teeth surrounding the missing ones, and these will be attached to prosthetic teeth to fill in the gap. This not only helps with the look of the smile, but it also makes sure that the bite is evenly distributed, plus it keeps the remaining teeth from shifting out of place. No matter which restoration you need, what you can always count on is quality. Dr. Olsen will take the time to personally design a crown or bridge that fits seamlessly into your smile so you can always feel confident whenever you show off your teeth. If you have a few teeth that are in need of repair, or even replacing, we’re able to provide the solutions you need. We can use these treatments to basically turn the clock back on your smile and make it seem like nothing ever happened. To get started, contact us today for an appointment.